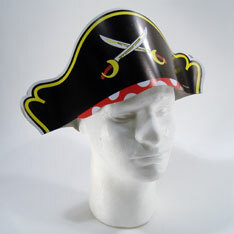 Paper hats for proper pirates parties. 5 ½ inch high crowns. 15 inches across. Made from thick paper. Sold by the dozen. $2.05 per dozen for 120 dozen or more.